Thanks Mike and Bob for the support! The calendar folks can do their thing and I can do mine. Cover and Rear Cover Pics!! Hey all, here's a shot of the front and rear covers (rear cover shows the winners and what the layout will look like). All winners will be getting an email soon to sort out shipping their free copies. Please check out our new thread by clicking here. I would like to thank MC for producing the calendar and be the first to so call (Brag) I slid in as the month of May! The thanks goes out to the participants like yourself for making our calendars the way they are. If I recall correctly, you were the first one to upload in our Solstice contest; a big cheers to you. These calendars are beautiful! I received mine last week and am so proud that my baby made March. Thanks so much for the hard work that went into making these beautiful calendars! Great job!! Won't find a nicer Solstice Calendar out there. We got our calendars last week and they are very nice ! Thanks for puting them together. Ah Feb. a GREAT month! Thanks again for the opportunity to have our cars selected for the calendar. Hope you can get on your feet next year to do something like this again. Well worth th effort! I was going to buy 2 calendars but $6.99 for shipping cost...wow! 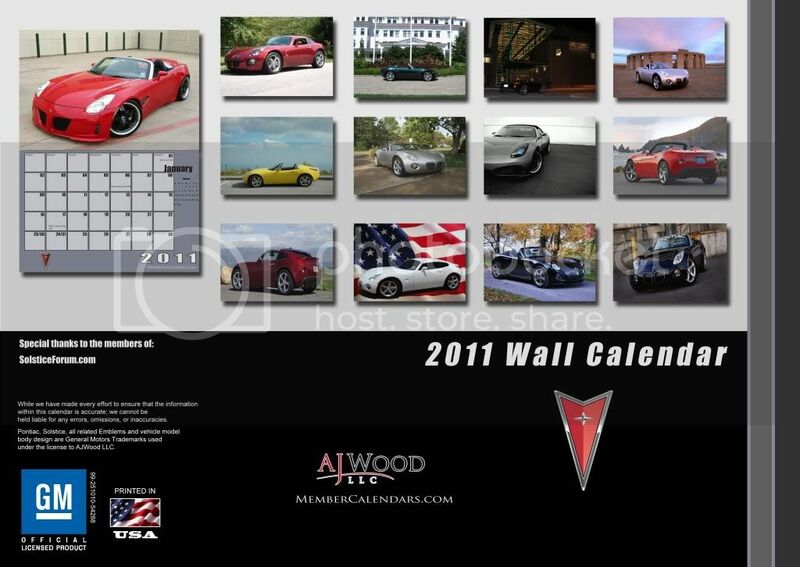 I can send 2 calendars anywhere in the continental 48 states priority mail for $4.75. Might want to sign up for a USPS account…just saying. So for $2.24 you wont? I received the calendar as a XMAS present. Got mine on Christmas Eve even though I has only ordered it earlier in the week. Thanks for the fast shipping. I was able to have it under the tree for my husband Christmas morning! His jacket didn't make it in time so at least there was something w Sol there for him. Sorry I saw the contest too late. Hoping to remember to submit a photo for the 2012. That would be a real nice calendar for him if it had our car in it. Happy & safe holidays to all! These calendar don't work for priority mail. They are too big. We'd have to use a priority mail box, which the calendar only fit in on an angle. Would have got mangled during shipping. We had to order custom stay flats and send these USPS First Class Parcel. Most companies make money on shipping, we are barely breaking even. It's really a good and bad thing. We chose 9.5" x 13.5" for a few reasons, but the main being it's a nice big size for a wall calendar. The bad thing is how we have to ship them. Shipping method is something we spent a lot of time on even met with 2 postal reps at our fulfillment house. This was the cheapest way to send these wide, oversized calendars. Something we may have to re-evaluate though for next year!!! I got this calendar as a Christmas Gift. I LOVE it!!! !.....Great Job. 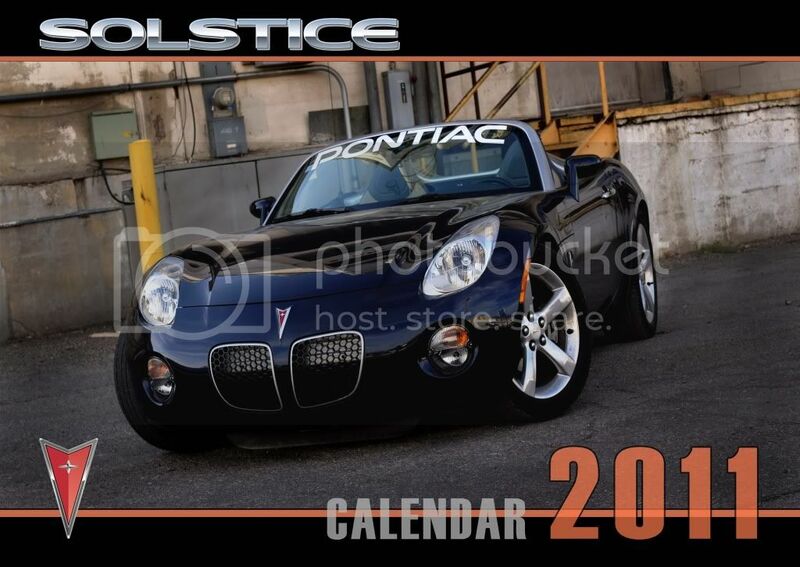 2007 Pontiac Solstice GXP Deep/Ebony/Silver Stitching, traded 8/17/12 for a 2012 Ford F150 Lariat...I'm very sad. The point was not what I am willing to pay for shipping…the point of my post was that buying two calendars should be able to ship in same package at a reasonable cost. After reading MemeberCalenders reply I now understand why the cost is a little higher than it could be and I am ordering two calendars. Now as for the little guy running around like I am crazy because I believe in saving a buck on shipping cost…hmmm what I wonder about is why everyone here can’t spend $40.00 dollars for a life membership? It helps the forum stay alive!!! Also why some people join the forum for free and then advertise a business in their signature…hmmmmmmmm who’s really saving a few bucks around here??? Talk about an inappropriate response. You jump to ill advised conclusions a lot don't you?